We woke up this morning at 5:15am and were on the trail by 6. Andy slept well on his right side most of the night, avoiding the mountain on his air pad. We hiked behind Rambo and her dog Sadie as we descended to the highway. Sadie is really sweet and loves to play fetch. Rambo would throw the dog frisbee and Sadie would disappear into the foggy trees and come back wagging her tail, ready for more. This continued all the way to the trailhead. 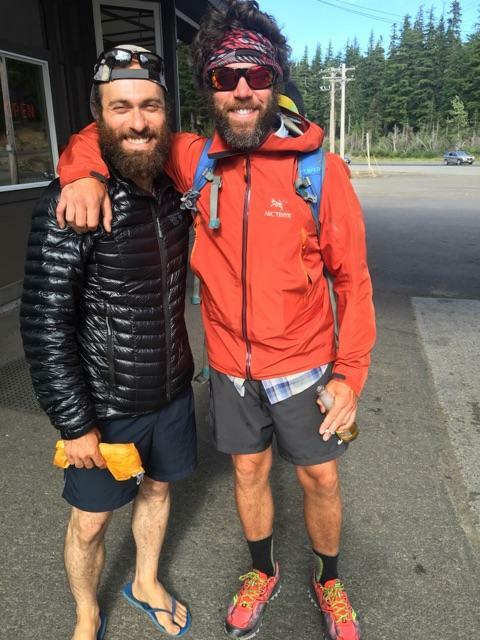 Once at the trailhead we changed into our town clothes consisting of shorts, fleeces and flip flops, and piled into the car. We can’t thank Rambo enough for offering to drive us into Olympia and to the REI there. She’s a thru hiker and knows how bad it can be when you experience gear failure on the trail. Before we started this hike Andy had read and heard the phrase “The trail provides” over and over again. But he never fully grasped it’s full meaning until today. The trail provides solitude, hardship, compassion, friendship, love, peace, joy, simplicity and truth. The trail also connects us with people that can help us achieve our goals. All we have to do is show up, be courageous enough to ask for help and accept it. Before we left White Pass and drove to Olympia we stopped by the Inn next to the store to see Nemo. Women’s appearances don’t change much on the trail, but men can change drastically. Nemo was clean shaven and ‘well put together’ in the desert, but now he had a bushy beard and epic hair – long, curly, salt and pepper hair. He was also slimmer. And more raw. We’re not sure if he’s lost his mind or if his true self has no filter any more. The trail changes us, whether we realize these changes taking place while we hike or after. We believe Nemo’s experiences in the Sierras have broken him open. He mentioned to us how we made the right decision to leave the Sierras when we did. That the river crossings were scary and almost took his life 3 times. We wanted to chat more but had to go. It was so good seeing Nemo. He is still a character and always smiling. It felt good making time to see him this morning given everything we had to do. The trail teaches us over and over to be like water – to be flexible. It’s perfectly ok to have a plan in place, but being able adapt to the twists and turns of the trail eventually makes for a more enjoyable hike. And so Rambo drove us 1.5 hours to Olympia. REI was still closed when we got to town so we went to Rambo’s home where we uploaded blog posts, sent postcards and responded to our readers’ comments. We love comments. Thank you to everyone who makes the time to read our posts and leave comments. Your encouragement helps us when things get tough. We also thank those who recently contributed to our town fund. We really appreciate it! 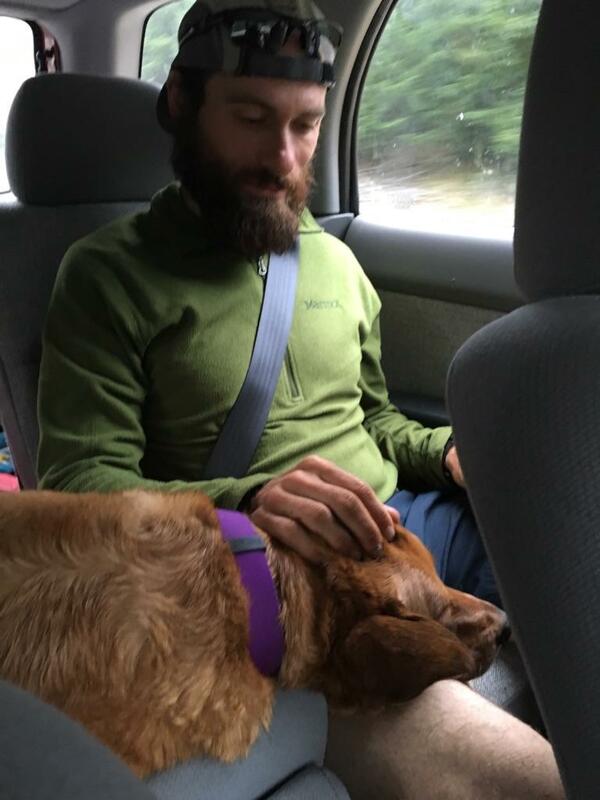 We got to the REI, picked the best air pads from their limited stock (along with a pillow and socks for Andy) and returned our defective ones. Rambo and her partner John then drove us back to Randall, a small town 45 minutes west of White Pass, enroute to their day hike destination. We ate at the cafe, charged our phones, camera batteries and external battery, and made a hitch hiking sign. We stood at the side of the highway with our thumbs up smiling. At first no one stopped. Fifteen minutes later and still no ride, we decided to make a bigger sign (a passing motorists signaled ours was too small) and moved to a better location. As it happened on Highway 62 near mile 220, Laurie managed to get a car to stop while Andy was working on making a bigger sign. A nice family from Yakima drove us to White Pass and dropped us off at the store. We thanked the generous family for the lift and headed in to pick up our resupply boxes. Sitting inside the store were Toaster and Smudge. A southbounder had warned them of the potential storms we received today, prompting them to speed up and hike through the Goat Rocks in good weather. It was great seeing them again and catching up! They are wonderful people. We also met Gilligan and a few others. It was now 4pm and we still had to sort through our food, do laundry and ideally shower. We figured we could do it all and hike out by 6, but it would be rushed. Even if we hiked only 5 miles we wouldn’t get to camp til 8pm. Then we would need to set up the tent, eat and blog…It would be another late night. So we decided to get a room and chill. We bought snacks at the store, ate an extra trail dinner and watched the Olympics. Time really does fly in towns. Before we knew it it was 9pm. We packed our bags and blogged until midnight. Tomorrow morning is going to hurt. But we suppose it’s all part of the adventure. Tonight we are grateful for our ability to be flexible and generous motorists. If you hike 2 miles or 30 a day, you are damn DOING this! I am so proud of the courage, sheer determination, persistence and guts you are showing! Water, snow, wildfires–you are still DOING THIS. you rock! I am loving your blog and wishing you safe travels! Your pictures are amazing!! I just love your perceptive comments about people, penned with gentle appreciation. Perhaps we all need to be “broken open”. Enjoy walking and talking and writing! All the best on the path ahead. Thank you very much for your support Daddyo! Wow, I just missed you. Live in Tumwater – 15 minutes from the Oly REI. 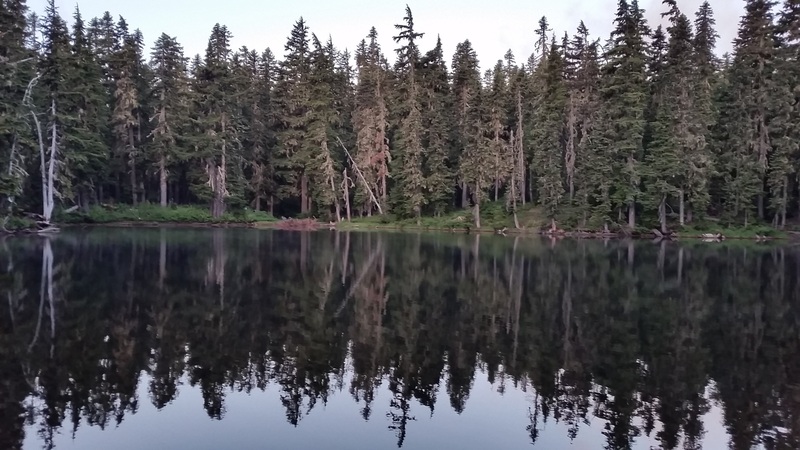 Your next posts will probably take you to Snoqualmie Pass. It’s great you are in Washington early enough to see some of the flowers and have good weather. For many thru hikers the North Cascades are passed in cold rain and limited views as the race the first winter snows. Our 400 mile skip has really worked out in our favor. And we’re hoping it continues as we venture north! its been fun keeping up with ya’ll blog! It was fun meeting ya’ll and I was glad to help out. Also..Congratulations! Only the best place for a proposal. Props on the candy ring too. Good luck with all future endeavors!